For years, I've heard about Larry Rothschild's supposed ability to turn struggling pitchers around. Since he's arrived in New York, however, Rothschild has not been able to live up to such expectations. Whether it be Michael Pineda, Nathan Eovaldi, or any one member of the current circus of relievers, the pitching coach has continuously failed to help his struggling pitchers effectively address the source of their problems. 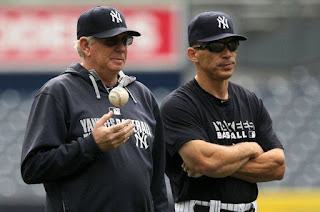 Before I go any further, I must emphasize that I believe Joe Girardi is the root of the problem, and Rothschild is an extension of his manager, but the fruit does not fall far from the tree. Rothschild has been in New York since 2011, and the results have not improved. It is now time for the Yankees to bid farewell to Mr. Rothschild. As of late, the Yankees bullpen has been an unmitigated disaster. While it must be noted that some of the starters, most notably Luis Severino and Jordan Montgomery, have shined since veteran CC Sabathia landed on the DL, Masahiro Tanaka and Michael Pineda have struggled mightily. Over the past few years, the Yankees have been guided by an odd thought process. They believe that they can acquire struggling pitchers, and somehow, miraculously, help them turn their careers around. This strategy has not been successful. The underlying reason behind this theory is pitching coach Larry Rothschild. For example, the Yankees have taken gambles on Michael Pineda and Nathan Eovaldi, two erratic young pitchers with phenomenal stuff, with the hope that Rothschild could lead them to Major League success. Needless to say, this strategy has not paid dividends. Pineda and Eovaldi perfectly exemplify the grounds for my argument. Pineda has been a Yankee for the entirety of Rothchild's tenure in the Bronx. Not to mention, Big Mike has been a prioritized project for the Yankees organization during that period of time as well. Granted, Pineda did spend a significant amount of time on the DL, but he's spent more than enough time with his pitching coach to learn how to turn his electric stuff into consistent performances. For the first two months of 2017, it appeared that Pineda finally figured it out. Unfortunately, he is back to his inconsistent ways. I would like tosimply blame this on Pineda, but it's part of a disturbing trend. Leading into the 2014 season, the Yankees foolishly traded Martin Prado and David Phelps to the Miami Marlins in exchange for Nathan Eovaldi. To capture Eovaldi's troubled stint in one paragraph would be impossible, yet I will note that he is no longer a New York Yankee. Let's leave it at that. Dellin Betances, despite his sustained dominance and status as one of the top relievers in the game, has serious command issues. You have to imagine that similar to Pineda and Eovaldi, Rothschild has worked extensively with Betances to locate the strike zone better, but to no avail. Let me explicitly articulate that I am NOT comparing Betances to the likes of Pineda and Eovaldi, but the common theme does exist. Seeing Yankees pitchers repeatedly make the same mistakes is increasingly frustrating. We haven't even delved into the bullpen yet! Fast forward to 2017, and the Yankees pitching staff is in the midst of a crisis. 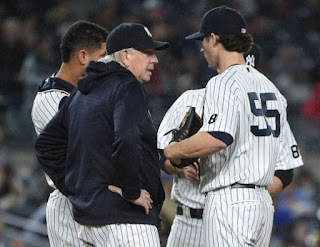 The pitching alone is not responsible for the Yankees recent struggles, but it deserves enough of the blame that the organization should be looking at Rothschild's immediate future. When things are not going well, changes must be made. Apparently, this rule does not exist for the Yankees organization since executives, coaches, and even some players get long-term passes for mediocre behavior. Some Yankees pitchers have developed nicely under Rothschild's tutelage, but the failures far outweigh the successes. The Yankees have had a number of busts since Rothschild's 2011 arrival. As much as I, along with many other irate Yankees fans, would love to see Joe Girardi gone, he will at the very least finish his contract before the club reassesses his future this offseason. However, firing Rothschild in the middle of the season would not only remove a coach who is not getting the job done, it may also send a message to the team that its play as of late is unacceptable. Larry Rothschild has been given a free pass for too long. His inability to live up to expectations can no longer be overlooked. Statistically, the Yankees pitching staff has been ever since Rothschild first donned pinstripes. While this can be attributed to personnel (i.e the fault of Brian Cashman), Rothschild is the logical scapegoat. Continuously failing to "fix" or further develop pitchers with electric stuff, while simultaneously overseeing an unimpressive staff for almost seven years, is more than enough to warrant a firing in this case.